Dorothy insisted that he get to work on the idea right away. Confidentially, Al thought the whole thing sounded just a bit more than silly, even for a screen queen. But Lamour’s famous South Sea smile is pretty irresistible in a Beverly Hills fur salon, too. Nothing would do but for Al to sit down right then and there and make Miss Lamour a fur-lined phone. So he cut out a pattern and sewed together three skins to dress up Alexander Graham Bell’s invention in a smart new mink coat. If it were a gold-lined garment for herself, Dorothy couldn’t have been more ecstatic about that new “creation.” When he saw the joy with which she caressed her novel gift, it dawned on him that he had discovered a new and potentially profitable sideline to his regular fur-designing business. 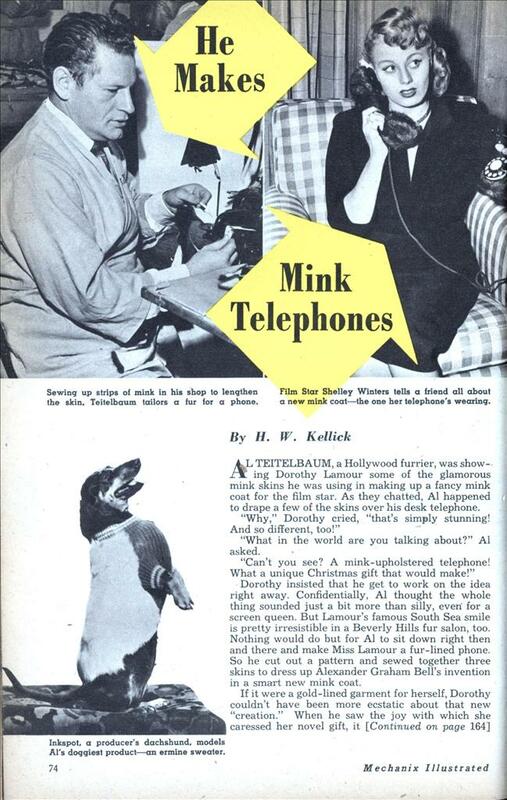 Soon other Hollywood personalities beat their way to Teitelbaum’s shop to order their mink coats for phones, too. That really started the fur flying. He was swamped with requests for more fur novelties that quickly gave him a far handsomer income than his original business. Although much of his trade still lies in making up fine pelts—some of which sell for $85,000 per garment—to adorn filmland’s favorite daughters, he gets his biggest kick, in both fun and money, from fashioning zany fantasies in fur. He found a lot of fun, for instance, in working up an ermine jacket for a top movie producer’s cute dachshund. 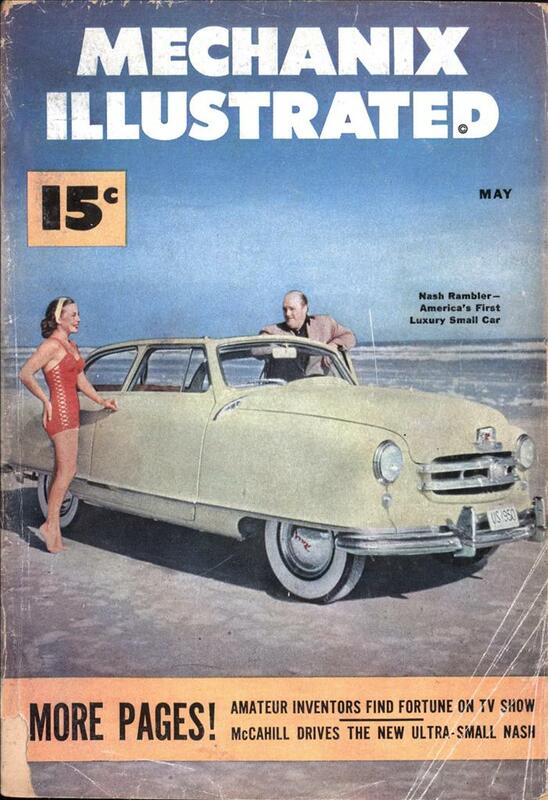 It was even more fun, to be sure, when he whipped up a white ermine necktie for Lana Turner and a leopard-lined raincoat for Paulette Goddard. One of the phone furrier’s wackiest items was a giant fur-lined nest. To call attention to the film, The Egg and I, Jim Moran, the “madman promoter” (see March, 1949, MI) tried hatching an ostrich egg. For this remarkable enterprise, Teitelbaum decorated a special custom-built nest lavishly with summer ermine. That project got plenty of publicity but, unfortunately, didn’t add any new plumes to the ostrich population. Another of Al’s oddities is the fur-lined bathtub. He designed this plumbing extravaganza for a dream sequence in Sol Wurtzel’s “Miss Mink of 1949.” The script called for Lois Collier, as a bride driven slightly berserk by radio giveaway programs, to appear in a bathtub. Al used sleek ranch-mink to beautify the bathtub. Ironically enough, this elegant scene fell flat; later it was snipped out of the film and dropped on the cutting-room floor. A few years ago Al made up an apeman suit for a horror picture. When the villainous “critter” carried the leading lady off across the desolate moors, the poor girl tried in vain to scream for help. Unhappily, she was too busy sneezing to let out even a mouse squeak. It turned out she was extremely allergic to the coarse hairs in the apeman’s costume. That night Al sat up late working on the problem. He remade the suit—using the finest grade of soft mink for the “ape” skin! The next day the scene went off successfully with the star screaming blue murder right on cue. Curiously enough, people often ask Teitelbaum whether fur novelties are difficult to turn out or can be made cheaply enough to reach a mass audience. Well, let’s take the mink telephone, for example. To make this, Al uses three mink skins. Mink skins, you may be surprised to learn, can be bought for $10 per skin, although some of them cost $40 or more per skin. Most of his fur phones are made of the $40 kind. That makes the cost of the skins alone $120. Since Teitelbaum employs a big staff of fur specialists, he therefore must consider the problem of labor. The cost for labor in this instance is about $30. This brings his cost up to $150. So he sells the complete item for $200 —at a neat $50 profit. Another profitable and popular novelty is the fur lampshade. Al usually makes this out of American broadtail—four baby lamb skins going into each woolly shade. At $12.50 per skin, and a labor cost of $15, the finished masterpiece represents a cost of $65. For that “light” work of art he gets $95—and thus shears off $30 in golden fleece to line his own pockets. Unique, too, is Al’s leopard umbrella cover. He generally charges $75 for this bad-weather fantasy. The price, you understand, is wholly dependent upon the grade of pelt used as well as the labor involved. In most cases, though, he uses scrap pieces or No. 2 grade of leopard, since this fierce feline’s pelt comes a bit costly even for Al’s super-swank novelties. You can duplicate this umbrella cover, however, by dropping into a furrier’s workroom and buying a fair grade of leopard scraps. About $10 of odd pieces will give you enough material. The scraps are then sewn together by hand and the result is a dramatic top coat for your bumbershoot. In great demand, too, are fur jackets for dogs. To make Fido an ermine sweater, Al uses at least five skins, even for a baby-sized bow-wow. However, you can achieve the same effect with Angora rabbit. Two rabbit skins will keep any pooch smaller than a police dog snug during the bitterest blizzards. Most of Teitelbaum’s patrons like a lot of color in their novelties. He finds that Rit or the other popular dyes are very effective in adding gay hues to home novelties. Of course, he cautions that though these dyes give you serviceable costume furs in brilliant color they bleach out into odd tones if you expose them to the sun. To get best results from tinting, Al boils the dye in a water solution. After the liquid preparation has cooled, he paints the color carefully on the fur with a brush. If you fancy fur fantasies, here’s another word of caution. Stay away from black or brown pelts. They won’t take home-dyes. White ermine, kidskin, American broadtail, caracal, rabbit, mole and muskrat are ideal furs for the amateur furrier since they readily take shades of pink, red, green or brown dyes. Naturally, the number of skins you need for a novelty depends on the type of pelt you pick for your project. Ermine, for instance, comes from a diminutive Arctic weasel. It is such a narrow, tiny pelt that it requires many skins for even a small creation. Thus, to make an ermine bib for baby, you must buy 10 expensive ermines. You can get the same effect, though, with the larger pelts such as caracal, Persian lamb or rabbit. Two skins of these furs are enough to make a full-sized bib for junior to wear as a catch-all for any food that fails to go down the hatch. What’s more, mother can use the bib as a neckpiece for her dress the next time she goes a-partying. When Al gets an order for a fur novelty, the first thing he does is make a pattern. Then he lays out the skins and tacks them down on his work table, flesh side up. Next he places the pattern over the skin and anchors it with thumb tacks. Then he chalks the outline of the pattern on the skins. Now he’s ready for the cutting process. Best cutting instrument, Al thinks, is the regular furrier’s knife. It costs less than $3. A one-sided razor blade, however, also will do the job. But never cut with scissors, for you’ll damage the hairs of the pelt. After cutting, the furs are ready to be joined. Most of this work is done by hand in Teitelbaum’s shop—with all the sewing from the skin side, of course. The sewing machine, though, can also be used for the joining and works much easier and faster for rabbit and caracul. There’s no limit to the novelties that you can fancy up with furs. Recently, for instance, Al took a worn coat and turned it into a fashionable lady’s vest. By removing the sleeves and bad spots and trimming the coat down to size, he converted a discarded fur coat into a stylish new garment. Oddly enough, Al’s found that men are interested in furs, too. Dore Schary, Metro- Goldwyn-Mayer executive, for example, sports a calfskin jacket. Mole jackets for men are quite wearable and popular, too. Even husband-and-wife matching outfits are something to think about. For less than $500 Mr. and Mrs. can knock the neighbors for a loop in twin outfits of fawn galyak, a practically weightless, supple fur. For hubby, Teitelbaum turns out a galyak suit featuring a cardigan jacket and trousers that hold a good crease. For the better half, Al makes a sleeveless galyak jacket that fits over a black knit sweater, with trim slacks fashioned out of the same fur. Mitch Leisen, the movie director, had his limousine upholstered in zebra skin, and Milo Anderson, the designer, has a room full of furniture decked out in fur to set a new standard of luxury for his lolling Hollywood guests. The Mongolians traditionally don’t skin minks for clothing. They instead harvest the undercoat via brushing* and spin the resulting fiber into yarn, often combining it with cashmere or yak undercoat for durability. You can still buy mink yarn today,. * And no, I do not know how live minks take to being brushed, but it’s apparently a very old tradition in Mongolia. Maybe they’re domesticated and are used to it. Mink telephone? What kind of weird breeding programme is that!? I thought that was James Gregory. James Gregory? Nope, that’s definitely Shelly Winters. Fur coats for already furry animals: one of the stupidest ideas ever to come out of Hollywood. It’s not even as if they’d be cold there.